a) What is the purpose of social media for your company? b) What is social media’s value proposition? 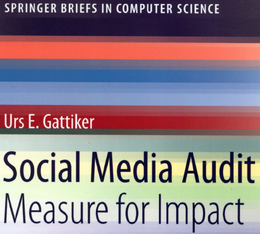 c) What results must be achieved with social media and in what context? d) How will you know when you got there – measuring and benchmarking? However, when it comes to engagement, things get a bit more difficult. Here are four tips to secure better engagement with your audiences in 2012. Social media engagement represents the action of engaging with others using computer-mediated communication tools. Engagement means establishing and sustaining relationships, while developing a level of trust that makes people comfortable enough to do business with you. Continued engagement through social media could manifest in a ‘conversation’, such as a blogger replying to a reader’s blog comment, or as a discussion of a user-posed question about or evaluation of one’s product in an online community. Social media offers companies the opportunity to get people involved and interact with the brand. However, it will not happen without effort and resources. Seth Godin pointed out that we must move beyond impressions (e.g., one million impressions on Facebook due to our ad campaign) and focus on getting the client’s permission. In our figure below, permission means getting the reader, client or potential employee to sign up for your newsletter or blog posts. Accordingly, they give you permission to send them targeted content on a regular basis. Web analytics experts call this a micro-conversion. In combination with a mezzo-conversion (see y-axis below), we ultimately may end up with a macro-conversion – the actual sale, order or job application. In the context of human resource marketing, a person subscribing to your content allows you to stay in touch and provide that individual with relevant information. Nevertheless, this does not ensure their application next time you have a job opening they would suit perfectly. The figure also illustrates how a person may already follow your Facebook or Google Plus page before they subscribe to your newsletter. Gaining permission to send someone information still means they are a passive recruit. Ideally, they read the information coming their way, but realistically they usually will not. The 900-98-1.5-0.5 rule suggests that 900 out of every 1000 people never see information sent to them, 98 people read it, one-and-a-half people share it and less than one person writes original content in the form of a tweet or reply. You can only hope that people reading your content find it interesting, and therefore share it with their peers (e.g., by tweeting about it). The orange arrow shows the progress of an individual who visits your site thanks to search results. They may even comment, leading to a discussion with the author (see these replies and back replies). The objective is to get this commenter to sign up for your newsletter, though this may be unrealistic and you should consider yourself lucky if they follow your Facebook page. 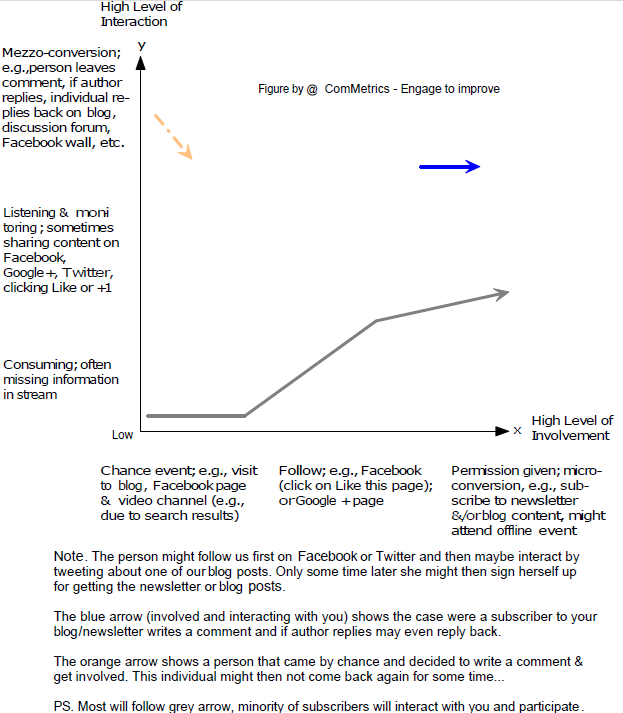 The blue arrow illustrates getting passive audience members to become engaged. This occurs by not only enticing them to read your posts but to share them with their colleagues on LinkedIn, through chat or in discussion on your blog. You’ve come this far, why not subscribe to our award-winning blog and join our 5,000+ subscribers? 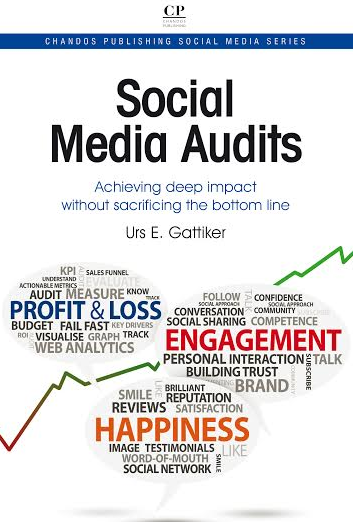 Some experts tell us that failure to engage with clients who are already using social media platforms like Facebook or Twitter is a form of ‘social negligence’. Really? What we can agree on is that using social media to engage existing and potential clients is more of a business obligation than ever. Maybe only because if you do not engage, someone else will, but that would be a rather sad way to lose business. Metrics that can be used include the number of blog subscribers, and average number of comments to a blog post, or even such innovative ways as keeping track of how many clients mention your social media efforts during a business lunch or cocktail party you both attend. There is no universal template for metrics to use. You must design the metrics that will help you achieve whatever strategic objectives your top management sets for 2012 (check out Why the boss thinks 125,000 monthly pageviews mean failure). We have developed a five-step method that will help you implement an interactive recruitment approach. Anyone interested should leave a comment and we’ll send you the checklist. – Why does engagement fail? – Is blog and Facebook engagement obsolete? – You Finally Have a Google Plus Business Page… Now What? – sharing insights, opinions and experiences, publicly and privately. Accordingly, in the human resource marketing context, a blog or newsletter, discussion group or community offers the opportunity for high-value candidates to raise their hands and request more information based on conversational exposure. Nevertheless, as the Top 10 forgotten social media questions illustrate, not everybody wants to engage with a brand. For now, we must get the word about job openings out via our blog and Facebook page or use these channels to announce a recruitment open house. Do you have any suggestions that other firms will find useful? If so, please add them in the suggestion section below! Here is an example of how Henkel tried to use YouTube to make recruitment more interactive. Can you spot the three things to fix to achieve engagement with potential job applicants? Hey gattiker, excellent post. I got what I have looking for. The article is informative and good. It would help to know how to setting up ad campaign for your business. Dear @google-51ce6fd816288356ae2ad2b8c19df1b5:disqus thanks for the praise. But besides pushing your marketing business with a commercial….. how do you manage your engagement efforts – what will you do better in 2012. Next post: Could Google+ fail in 2012?